The following is a recap of our conclusions from the fxempire.com weekly analysts’ meeting about where we focus our attention this week. This week the economic calendar will directly drive markets like it hasn’t before in recent memory. Not only is this calendar packed, it also comes at a time when the market is unusually sensitive to it. Debt crisis related issues from either the US or Europe. They’re currently deferred, although as we discussed here, decisions about how to fund capital shortfalls to be uncovered in EU bank stress tests could well awaken the hibernating EU crisis. Unusual geopolitical tensions. Sure, some action in my neighborhood, the Mideast, but in this part of the world the events of the past week literally “come with the territory,” sadly. The market moving energy from earnings season is largely spent. The picture has set: more or less in-line with expectations, which were not high. There are still too many earnings ‘beats’ that are not coming as a result of sustainable robust revenue growth. Second, as we discussed in depth here, virtually all major global financial instruments, such as the major stock indexes, currency pairs, key commodities, bonds, etc., are deeply influenced by the current consensus on major central bank policy. As the central bank with the largest economy and least settled policy, the Fed is in particular focus. However the Fed policy, and the speculation about it that moves markets week to week, is clearly moving on the data this same economic calendar turns out. Third, using the S&P 500 daily chart below as our representative picture of overall risk appetite, we see that markets have gone nowhere for the past week. That’s no big deal by itself, especially given that this ‘nowhere’ is an all-time high, and many other global indexes are at multi-year if not all time highs themselves. However the point is, it’s not unusual for markets to pull back and test support after making a run higher. So again, it’s all up to the calendar. The cross shaped candles, called dojis, suggest indecision that often forecasts a pullback after a sustained move higher like the one we’ve just seen. The S&P 500 is currently around 1750, which is the upper end of what the more bullish analysts predicted at the start of 2013. Just saying. The first week of the month’s economic calendar is typically packed, if for no other reason than that is contains the US monthly jobs reports, which typically carry a series of preliminary related reports which themselves can be market moving because they feed speculation about the all-important official BLS jobs reports. This week’s calendar is extra-packed due to a convergence of scheduling circumstances, such as last month’s US government shutdown causing the week’s deferral of the October monthly jobs reports release from Friday November 1st to November 8th. That means this critical data comes in the same week as batch of major central bank rate statements and press conferences, other top tier data from the leading economies, EU bond sales, and FOMC members speaking. So here are the likely market moving events to watch for the coming week, and any useful thoughts we might have about them. See any good economic calendar for prior month results and consensus expectations. Note that a wild card with US data will be revisions to prior month’s data, which can themselves be market-moving in either direction, if the surprise is big enough. The following listing of events is organized in a rough order of importance, with the events more likely to be market moving events in the upper part of the list. Which ones actually prove to be most market moving will depend on which ones, among the upper part of the list, bring the biggest surprise. These include not only the headline non-farms payrolls and unemployment rate, but also average hours per week and hourly wages. Jobs, spending, GDP and inflation are the key metrics the Fed is watching to determine the rate and pace of QE and interest rate increases, and risk asset markets are rising or falling on changes in what it’s thought the fed will do about these. Consensus is ~126k new jobs, less than the 150k believed needed to keep up with new monthly entrants into the workforce. Plus or minus 10% is unlikely to move markets much, but if it does would likely be bullish as it would signal enough weakness to continue QE but not so much weakness as to cause a risk asset selloff. The big picture – of stagnant hours wages, and thus incomes, isn’t changing, and that will be ominous for the coming US holiday retail season, when the consumer based US economy (70% of US GDP) makes most of its money. No wonder Morgan Stanley is predicting the worst US holiday shopping season since 2008. See here for details, then think about how that hits jobs and GDP. Still think the Fed will taper by March 2014? But is that bearish, at least in the coming months? Remember, it’s a QE, QE world. Given the dour consensus, the likely outcome is neutral to positive for risk assets, and thus neutral to negative for the USD and other safe-haven assets and currencies. Anything better than awful will be seen as pro-QE and bullish, and any positive surprise is unlikely to be so positive that it’s seen as endangering QE. Again, important because it could be so influential in determining Fed monetary policy, or what markets think it will be. Consensus is 1.9%, below the 2% believed needed to keep the US out of recession. The ECB is not expected to cut rates but is expected to sound dovish. This could be market moving if the ECB does a reverse of the Fed’s act last week, and sounds a little more dovish than thought. If so, EUR down, stocks up. We would likely also see an unusual but totally understandable rise of the USD along with stocks and other risk assets. That would be a divergence from the normal negative correlations between risk asset stocks and the safe-haven USD, but not an ominous one, like the one we saw with the EUR and S&P 500, discussed in our recent posthere. Rather it would be one with an easy explanation. That would just be due to the normal tendency of the USD and EUR to move in opposite directions, because a selloff in one prompts purchases of the other. See here for details on that. Depending on how much the USD rises, certain USD pair counterparts, and USD priced commodities would come under pressure too. Complicating any prediction is the fact that we’ve already had some pullback in the EUR, due in part to the more hawkish, USD strengthening FOMC statement, as well as technical resistance, and possibly anticipation of dovish ECB comments. As a service-based economy, the jobs component of this report tells us a lot about the likely outcome of the official jobs report (and thus gets Fed QE speculation rolling). Thus any surprise here could be market moving. This and the below China data give us our latest read of the second or third largest economy. As with any batch of data that comes in at the same time, its influence will be greater if it all provides a surprise in the same direction, bullish or bearish. As with the other central bank statements below, this will be market moving to the extent that it suggests a change in policy. Given the venue, no such comments are expected. Sentiment indicators are notoriously unreliable but this one is considered top tier and so at least provides and excuse for a move if the reason behind it is unclear. Australian retail sales – as always, Australia is a proxy for how much stuff China is consuming, which is what everyone really cares about. UK construction PMI: of importance to those trading UK stocks or GBP currency pairs. 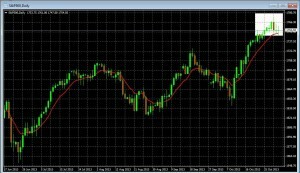 –Tuesday: RBA rate statement, UK services PMI (comments above apply). –Wednesday: Australia trade balance – again, a China proxy reading. Australia jobs report – see prior comments. Spain, France 10 year bond sales: market moving only if much higher or lower demand and rates. 11-12: Phantom Menaces & Unresolved Debt Crises: Who Pays? When? And With What Currency? Qui-Gon Jinn: I don’t sense anything. Obi-Wan Kenobi: It’s not about the mission, Master. It’s something… elsewhere. Elusive. Qui-Gon Jinn: Don’t center on your anxieties, Obi-Wan. Keep your concentration here and now, where it belongs. Obi-Wan Kenobi: But Master Yoda says I should be mindful of the future. With the above in mind, be mindful of the following, (as well as the living force). The following are not likely to be market moving next week, but keep an eye out for them, because when the lid comes off them, and it will, they will likely become THE story of the week and beyond. —US Debt Ceiling And Budget Crisis Round 3: See here for a taste of what could be coming, just in case you thought Washington would never embarrass itself like it did a few weeks ago. However the EU and US debt crisis end, the resolution is likely to involve a lot of money printing and currency debasement. Those based in these currencies should consider diversifying their assets into assets more likely to retain their value. There are a variety of simple, low risk ways to do that. See here or here for details.